Fully Loaded is a super sire who injects loads of muscle, mass and dimension into his progeny. 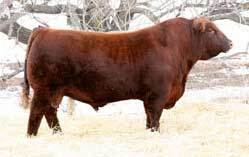 His fame began at an early age, when he was named the Bull Futurity Champion as a calf at the 2005 Red Roundup. He sold for $50,000 for half interest in 2006 to Six Mile, and later sold for an even higher price. Fully Loaded was named Champion bull at the 2007 Farmfair International and Agribition, where he was also crowned the Supreme Champion Bull over all breeds! Fully Loaded's first calf crop produced three Division Champions at the Canadian Western Agribition! His influence will impact the breed! The first daughters in production are sure to improve his Milk EPD. They are working great. AMF, OSF. Volume discounts available.